Tina Hager is director of the Ponder Public Library. A new partnership between Texas Woman's University and the Texas Library Association aims to help rural libraries in serving the needs of their community. Rural libraries in Texas face many challenges — they don’t have a lot of resources, but the people they serve have a lot of needs. A new effort from Texas Woman’s University in Denton and the Texas Library Association is focused on helping them. As the director of a small-town library in Denton County, Tina Hager is used to doing everything. “I help with cataloging. I do personnel. I do customer service, programs, everything,” Hager said. Hager runs the public library in Ponder, where the population is about 1,500. The town is about a 20-minute drive to the city of Denton. The library operates out of what used to be City Hall. Hager has one employee — a part-time staffer who works the front desk, tending to patrons. Libraries no longer just check out books. Ponder Public Library teams up with Ponder United Methodist Church to provide sack lunches for children in the community. Across Texas, rural libraries like the one in Ponder often don’t have enough staff or enough money. They may only be open a few days a week or staffed by volunteers who aren’t trained as librarians. Yet, Hager says, these libraries are go-to places, especially in small towns. "Libraries are like the living room of the community." A new three-year project from Texas Woman’s University and the Texas Library Association aims to help rural libraries become anchors in their towns. With the help of a nearly $400,000 grant, TWU will select 20 applicants from rural areas and train them to work in libraries and form connections in their community. Those selected will get a master’s degree in library science through TWU’s online program. Texas Woman's University School of Library and Information Studies is working on this new initiative to help rural libraries. 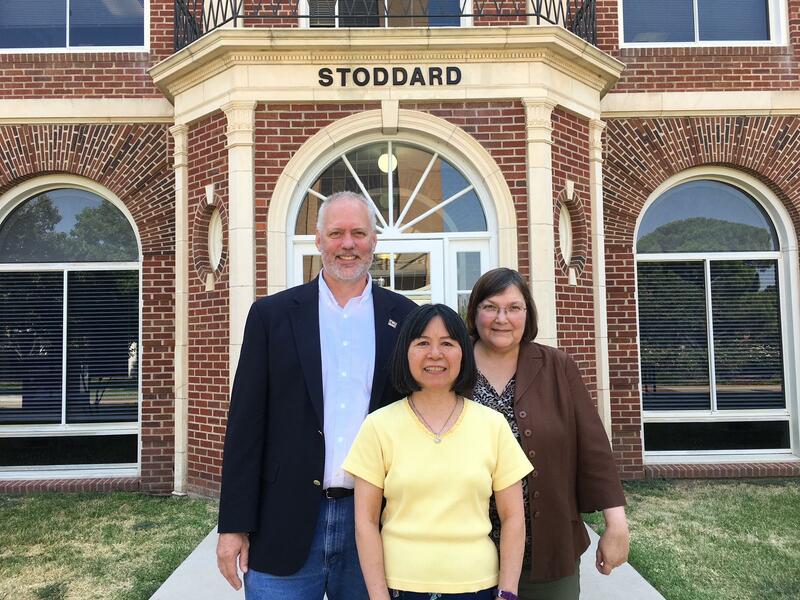 From left: Will Senn, assistant professor; Ling Hwey Jeng, professor and director of the school; Carol L. Perryman, associate professor. Perryman said all of the selected applicants will have something in common: They’re involved in their community. That includes parts of South Texas and the Rio Grande Valley, West Texas and the area outside San Antonio. The library initiative will focus on serving predominately Latino and Spanish-speaking communities that struggle getting access to social services. Jeng says the 20 students-turned-librarians could, for example, find a retired teacher to teach an adult literacy class or find someone in business to lead a financial literacy workshop. Kate Horan, director of the McAllen Public Library, points out that libraries do more than check out books. Residents rely on it for the internet, especially if they don’t have broadband access at home. Others may go to get help with their resumes. The library system there serves not only the residents of McAllen but a large swath of the lower Rio Grande Valley, including numerous small towns. Back in Ponder, library director Tina Hager points out that they also like to have fun. “I personally like karaoke,” she said with laugh. Once a week, patrons sing songs like Linda Ronstadt’s "Blue Bayou” and one of Hager's favorites, “Bohemian Rhapsody" by Queen. Whether they're working on a university campus, inside an elementary school or within a neighborhood, librarians are asserting their relevance in the age of the internet. Their biggest obstacle? People who "hold the purse strings" thinking libraries don't continue to provide an important service. That's according to one music librarian at the University of North Texas. Every year, a group of Dallas public school librarians puts out a list of 20 children’s books that are bilingual or in Spanish. The objective is to help other librarians pick out books for the nearly 40 percent of students in the district who don’t speak English or speak it well. Since this initiative began in 2006, the list has gotten the attention of librarians far beyond the district. Can you imagine a school without a library? It’s not unheard of in Houston, where the number of school librarians has dwindled due to budget cuts. The city of Arlington tore down its main library a couple of years ago. Officials said the Central Library was too outdated. There are several library branches still open. But, for now, the main library has had to seriously downsize.